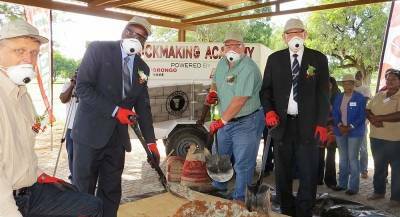 The Minister of Poverty Eradication and Social Welfare, Honourable Bishop Emeritus Zephaniah Kameeta, officially launched the Ohorongo Build It Brickmaking Academy at Tsumeb today. The Academy is the result of the Smart Partnership between Ohorongo Cement and one of its customers, the Build It group, in support of the Harambee Prosperity Plan, as their contribution towards the war on poverty. “It is a dream of ours to create a brickmaker in every village, to ensure sustainability and keep logistical costs down, while at the same time taking care of the communities in which they live and operate. 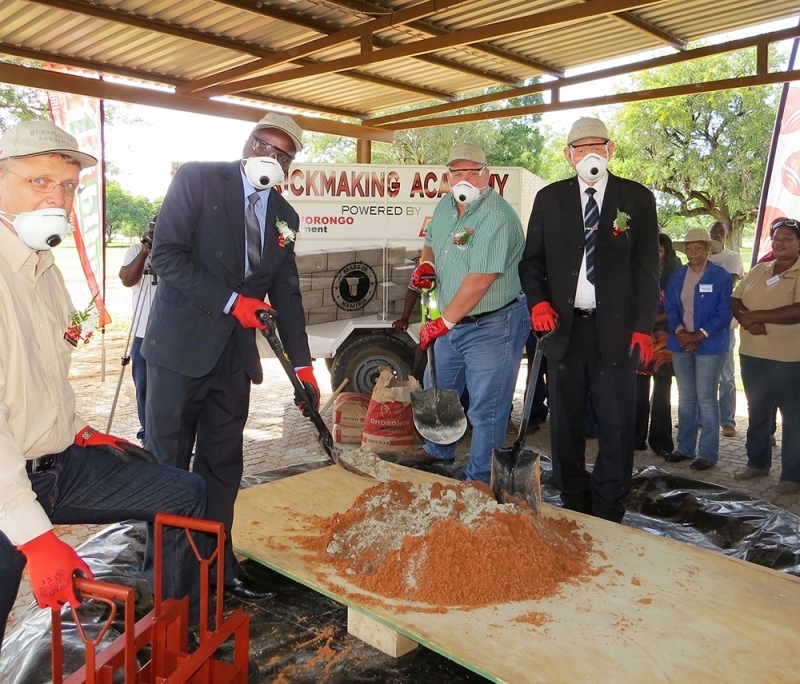 We envisaged that the brickmakers will use their newly acquired skills to assist in job creation, enabling them to not only sustain their own livelihoods, but actively play a role in the alleviation of poverty,” said Hans-Wilhelm Schütte the Managing Director of Ohorongo Cement. “This Brickmaking Academy is especially important to us as Cement, Bricks and blocks forms the stable foundation and framework upon which things grow - it is these bags of cement sold to our customers that keeps the economy growing, and as people build better and stronger houses, schools and places of work – employment grows, people prosper, children get better education and businesses can thrive and grow,” said Paul Hinson, Category Buyer of Build It. Honourable Bishop Kameeta thanked the two companies for spearheading the process of wealth redistribution, through skills transfer. “Poverty eradication should therefore be the top priority of all our efforts, both of Government and the Private Sector. Furthermore rooting out poverty will ensure social justice, which is a prerequisite for economic growth and any future investments in Namibia. ,” the Minister said. A total of 15 people received guidance on which aggregates would be the most beneficial to use during the brickmaking process. Each received a special training booklet for further reference. The target is to ideally train 210 people in all 14 regions of the country over a period of two years. Should each of those 15 people only employ 2 people, it could result in the creation of 630 additional jobs! Beyond the training, Ohorongo Technical Team, together with a support team from Built It stores, will continue to provide technical assistance and advice to the trainees to ensure the best outcome and high quality bricks. Build It has committed to purchase the bricks produced by the trainees, pending adherence to quality control measures. This would create a permanent offset area for their products and ensure sustainability of their business ventures. “As such, you have a great responsibility to be flag bearers of this Brickmaking Academy. Use your newly acquired skills and teach others, create jobs, go out and serve as a source of inspiration to others, to affect a positive change in your region,’ Schütte told the trainees. Governors of each region will be tasked to identify potential brickmakers in their regions, who will receive this training, free of charge. Each trainee received a certificate of attendance and special booklets in this regard is also distributed to trainees. These are the Top Viewed News & Media Articles. These are the Top Viewed News & Media Categories.